WOMWorld/Nokia has loaned me a Nokia E6 to evaluate. Here are my initial impressions and few unboxing photos. Hardware: This is one solid little phone. Mine is black with white and stainless steel trim which I think looks quite nice on this particular phone. The battery door and sides are metal and the front is all glass. The body of the phone appears to be a high quality plastic that is almost indistinguishable from cast metal. The back of the phone has a smooth satin finish that is somewhat slippery feeling. Build quality is excellent with tight, even gaps around the keys and between panels. The battery cover is secured with a positive latch. I detected no light leaks or creaking. The keyboard is one of the best I’ve used on a phone. Keys are nicely domed and have good travel with a strong tactile feedback when fully depressed. I had no problems with hitting the wrong key or multiple keys at once. I don’t like noisy keyboards and this one is among the quietest I’ve used with a barely audible mechanical key click. I prefer front facing QWERTY mono-block style of phones like the E6 for text entry while standing or walking. I like having immediate access to the keyboard without having to slide or flip anything. The keyboard’s small size makes one handed typing easy and secure. For faster typing it works well as a two handed thumbboard. The screen is on the small side at 2.46 inches. The form factor enforces a relatively small screen but the E6’s is smaller than competing QWERTY monoblocks like the Droid Pro (3.1 inches), Galaxy Pro (2.8 inches), BlackBerry Bold (2.8 inches) or even the diminutive Palm Pixi (2.63 inches). The small size of the E6 didn’t really bother me. I found the touch screen generally quite usable. In the browser and some other apps the Dpad controls a virtual mouse cursor that lets you easily click small links and icons. 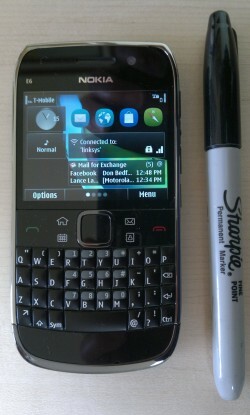 Software: The E6 ships with Symbian Anna which provides a huge improvement in performance over previous Symbian^3 builds. The traditional Symbian lag is all but gone. Swiping between the four home screens is instantataneous as is switching between running apps. The only time I experienced a lag was after installing a new app where the whole UI froze up for several seconds. My workaround for the font size issue is to use Opera Mobile for browsing and for reading HTML emails. Opera uses a reasonable and readable minimum font size and it supports zooming with text reflow. I use the Nokia email app to notify me of new emails and to read plain text emails but open any HTML emails in the Gmail basic HTML webapp with Opera Mobile. I really like the E6. The font issue is annoying but I’m hoping that either Nokia fixes this or I find a way to set a larger minimum font size in the email app. Even with without a font size fix I think that the E6 is my favorite Symbian phone ever. This entry was posted in Handsets and tagged Nokia E6, Symbian, Symbian Anna by Dennis Bournique. Bookmark the permalink. Keyboard is better than blackberry 9000?